Stepping on the Gas: West Philly dynamo/water activist Iris Marie Bloom leads the local charge against environmentally irresponsible drilling. Iris Marie Bloom is busy. Seriously busy. The night before we meet near her West Philadelphia home, she was in Warminster, screening a documentary and organizing residents. Three days before, she was at a rally in Harrisburg. As we talk, she occasionally checks the time; she has another interview that morning, and after that, her weekly radio show. “I’ve been working 17-hour days,” she says, smiling over her coffee. Her hazel eyes, however, show little sign of fatigue. She sits straight in her chair, articulate and focused. File folders, filled with articles and fact sheets, are neatly stacked at her elbow. For someone who works so hard, Bloom seems perpetually energized. Those endless hours of work — interviews, research, articles for the University City Review and Weekly Press, radio broadcasts, organizational minutiae, long drives through the night — are waged in an attempt to counterweigh Pennsylvania’s natural-gas boom, which Bloom, 50, sees as an environmental threat unlike any the state has known. As the director of Protecting Our Waters, a grassroots group founded in late 2009, she is a leading advocate of slowing down a process that has spun out of control. 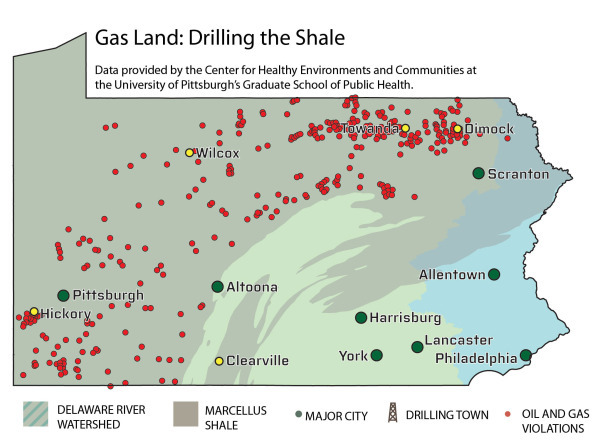 Sixty percent of Pennsylvania lies above a rock formation known as the Marcellus Shale. It’s rich in gas accessible only through a process known as hydraulic fracturing, or “fracking.” In 2008, the Department of Conservation and Natural Resources leased 74,000 acres of state forestland to a throng of oil and gas companies, all of them eager to drill. Despite such dangers, in Pennsylvania “there are no requirements for chemical disclosure; no requirements for greenhouse gas emissions,” says Bloom. “We’re fighting for more public comment and more public hearings.” Perhaps most crucially, Protecting Our Waters supports the extension of a Delaware River Basin Commission (DRBC) moratorium — the deadline for public comment is, at present, March 16 — on drilling in the Delaware Watershed until thorough environmental-impact studies are conducted. Bloom has witnessed such scenes. She’s been to Dimock and also to Hickory, home of fish kills, cattle deaths and ruined farmland. She’s been to Clearville, where one woman told of having her yard coated by an “unknown substance” that spewed from nearby gas-processing equipment. This theme — the plight of common people in the face of callous authority — has been a constant for Bloom. Born in El Paso, Texas, she grew up in northern Virginia before attending Wellesley College, in eastern Massachusetts. English degree in hand, she made her way to New York, where she began a life in activism. She worked with the American Committee on Africa and the War Resisters League before moving to Philadelphia in 1989. In the mid-’90s she founded and developed WAVE (Women’s Anti-Violence Education), a women’s self-defense program that continues today. Bloom’s work at WAVE was emotionally wearing, and after 15 years, she says, “I needed to fall in love with the world again. So I became a sailor.” She laughs. “Cheap little boats, but big adventures.” Bloom navigated the Delaware River and the Chesapeake Bay, sailed down to the Bahamas. She outran ocean storms and rode alongside dolphins. These hours spent at the tiller, observing the tides and fish, brought about a passion for water — and steered her toward a new career. Her subsequent study of the region’s waterways attuned her to their precariousness. “I was really devastated by the state of emergency that the Bay was in,” she says of the Chesapeake, which has been in decline for decades. Indeed, Bloom exudes a controlled determination, a warm and eager drive. She knows what she’s up against — gigantic corporations, acquiescent legislators, a statewide hunger for jobs — yet she feels compelled to resist. She tells me of deaths in Colorado, possibly due to fracking, in a tone of rational outrage. At one point, while discussing a family so wracked by gas fumes that their noses wouldn’t stop bleeding, she had to gather herself. She takes these wrongs personally. As our interview winds down, Bloom mentions Wyoming, where a decade of citizen action resulted in a law requiring chemical disclosures by natural-gas companies. She looks at my pad as I try to get it down. “Do you think you can write that?” she asks. I smile and say that I’ll see how the piece goes, if I can find a place for her entreaty. Considering Iris Bloom’s unflagging, hopeful effort, the favor seems to be the least that I can do.